Elizabeth Find M.D. : Diagnosis Mystery, Season 2 is rated 3.5 out of 5 by 10. Rated 5 out of 5 by Beadifferent from Love it I really love this game, I bought it after only trying it for 10 mins, there is just enough too-ing and fro-ing from scene to scene without you getting to the point where you get completely lost and forget where you are which I often do with some games LOL! storyline is really good, items not too difficult to find, all in all a great game.......but boy what a messy hospital! Rated 5 out of 5 by Eventually from Great game 2nd in the series & just as good as the 1st one. Nice pleasant HO to play for beginners and more advanced players with easy to see objects. Relaxing & enjoyable. Rated 4 out of 5 by Joreboji from I hate HOS! Now, having said that, I LOVED this game, lo! A friend recommended it to me knowing how I feel about HOS and based on her recommendation I tried both of these games in the series. I did not like the first one at all, but this one I really did like. The story line is good and I enjoyed the bantering between some of the characters. The only reason I did not give it 5 stars was because of the length. I wished there had been at last 3 more cases to solve! I thoroughly enjoyed the review of the patient at the end of each segment. Really made you use your brain to remember all the symptoms, etc. to come up with the right diagnosis. I was impressed with how thorough that segment of the game was. Only complaint I have is that I'm going to have to wait a while to play it again so that I don't remember what the illnesses are when I replay it, lo! Yes, at times you had to return to the same scenes, sometimes more than 2x, but you were asked to look for different objects each time. I also liked the fact that at times you had to open doors, cupboards, move leaves, etc., to find things. All in all I found it totally entertaining and enjoyable. I recommend this game. Rated 4 out of 5 by Eoarod from Perfect Cure for a Rainy Day! Just an all around super fun game! I would have given it 5 stars had it been a chapter or two longer - guess that's a backward compliment - give it a lower rating because I wanted more! Enjoyed finding useful objects in different locations (and via a map vs. wearing out sneakers walking back and forth was a nifty change) and super enjoyed the challenge of diagnosing the patient's illness at the end of each chapter! Knowing there's a "quiz" at the end really keeps you paying attention as you play! Though a fairly simple game, many items were challenging to find & the game has a nice element of humor - especially the irony of HO scenes in Intensive Care - WOW what a messy hospital! The characters are also likeable though pretty generic - the latter makes it easier to "know" them right away. All in all a clever little game! Enjoy! Rated 4 out of 5 by mspaws from Relaxing game Love HOG games with just a little bit of brain power ! I was able to follow the story and enjoy the plot. Like the characters. If you are a fan of HO's this will be the game for you. I liked the first one of this series too! 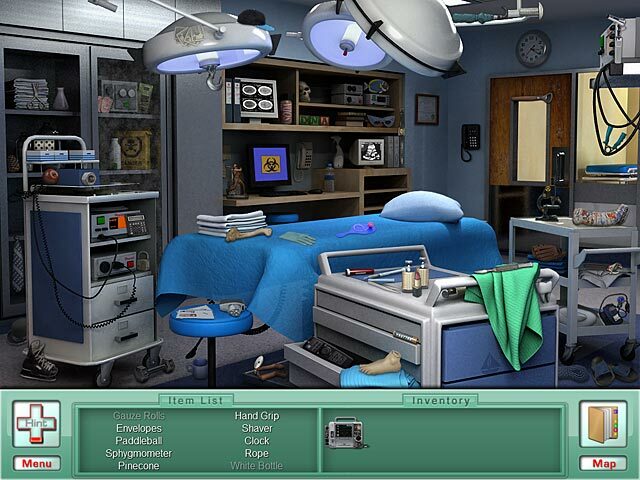 Rated 3 out of 5 by Selkie2283 from Too Short The game was fun - hidden object with a medical slant. I enjoyed the storyline, and solving the medical mysteries. I wish the hidden objects themselves made more sense to the scene and/or the case. What are bananas doing in the ambulance? Why is there a paddle board in the surgical suite? A little detail in that area could have added a lot to the game. 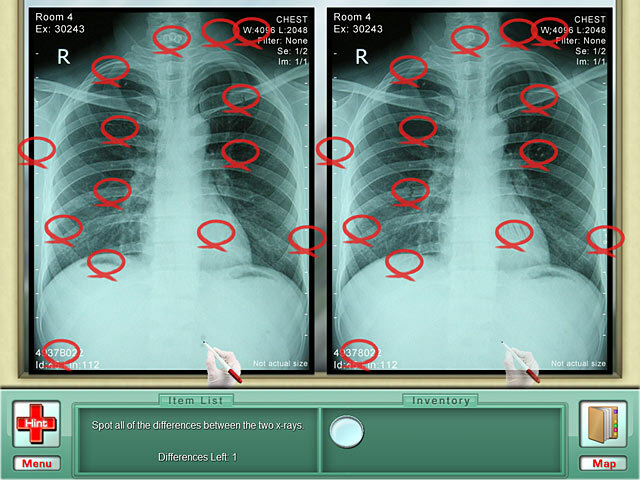 The mini-games are decent, and I enjoyed the one where you have to spot the differences on the x-ray. It's not terribly challenging, but it's not so easy that it's dull. It kept me entertained. The cases were interesting, but the overall storyline was kind of goofy. It's meant to be soap opera-esque, though, so I didn't expect much from it. It is, however, ridiculously short. I finished it in an afternoon. I'm not sure I would have paid for such a short game, had I known...That's the only reason I wouldn't recommend it. 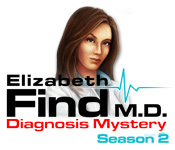 Rated 3 out of 5 by pennmom36 from Elizabeth Find MD: Diagnosis Mystery Season 2 Season 2 has made a few improvements since the first editions. For starters, the Hidden Objects are much easier to see. The first game had some items that were large and out of proportion mixed with tiny objects that were impossible to find because you just couldn't recognize the item. The graphics are more detailed than the last game, there is no timed mode and there still aren't any voiceovers. You can open up the map and visit any available location in any order, and there is a folder located to the right of the inventory bar which holds any clues or information you find on the patients you are treating. 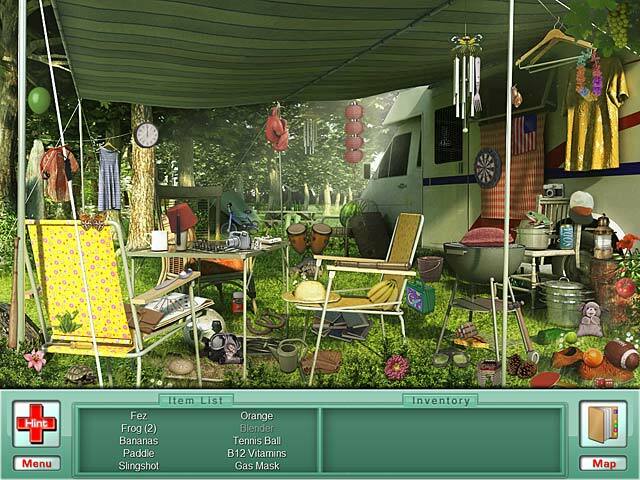 The Hidden Object Scenes are list finds, there are items in red which require an extra step to find them such as using an inventory item or clicking on an interactive area. Items that are grayed out cannot be found until an object is collected from another scene, fortunately, a window will pop up to inform you that nothing else can be done in the scene at that time, so you won't keep looking for something that's not there. I haven't seen this show, I didn't even know it existed, judging by the fact that the games only have two seasons, I would conclude that the show is no longer running but I could be wrong. Rated 3 out of 5 by arnold1049 from GOOD STORYLINE I enjoyed the storyline and the interaction among the characters. However, the game play was fairly simplistic and repetitive. There were 3 cases to solve but it was still a pretty short game. Really not much to recommend it, other than it is not dark and dreary. I liked the first game better. Rated 3 out of 5 by Kriskel from It was ok This game was not challenging. It was also very short. Some of the puzzles were repeated a couple of times. Rated 1 out of 5 by t_cup from patient This game needs to be more focused on how to take care of the patient, and trying to figure out a diagnoses and treatment, instead of trying to find objects. NOT much thought was put into this game when it was created. Unravel medical mysteries in this dramatic Puzzle Adventure game! Save your patients in Elizabeth Find M.D. Season 2!